You Can Never Be Too Prepared. 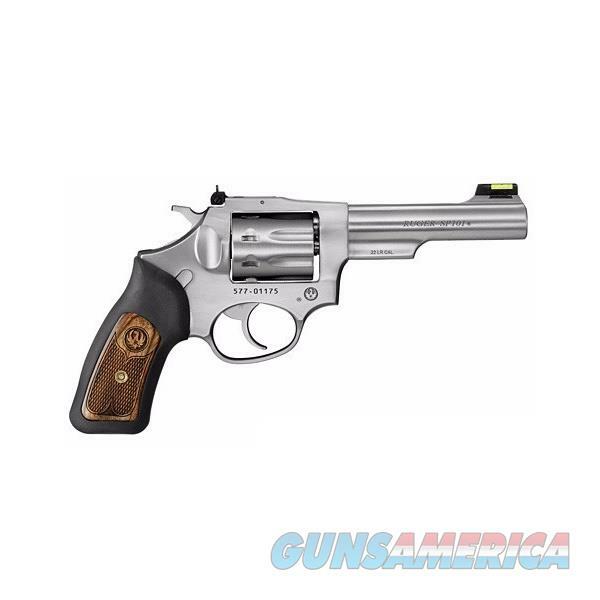 The Ruger SP101® revolver boasts the strength to handle the powerful 357 Magnum cartridge in a controllable, small-framed double-action revolver. Among the most powerful small-frame revolvers on the market, they are engineered for solid performance. Featuring a recoil-reducing grip, the SP101® is comfortable to shoot and perfect for personal defense or field use. Ruger's eight-shot, double-action .22 revolver is based on their stainless steel SP101 action/frame, but with significant functional and aesthetic improvements. Functional improvements over earlier SP101 .22's include a grooved rib atop the barrel, fully adjustable rear sight, ramp front sight with a green fiber optic (Hi-Viz) insert and, oh yes, an eight-shot cylinder. The barrel length is four inches. Aesthetic improvements include wood--rather than plastic--inserts in the black rubber grips, round barrel (instead of the earlier blob shaped barrel), short ejector rod housing (rather than a full length barrel under lug), crisper and better defined top rib. The walnut grip inserts are decorated with checkered panels and a laser cut Ruger eagle logo.